PARKROSE school board — in collusion with Gresham-Barlow and Reynolds — appears to have been planning since 2009 for the chaos and mayhem that it unleashed on the communities this year. When the boards claimed they were negotiating a new contract in good faith, it was not true. For a nearly a year they were not negotiating, they were following a playbook. They were working to a game plan first mooted back in January 2009, and honed by January of this year into a playbook for the district superintendents to try to break the teacher unions. Their goal was to raise up the administrators, including themselves,… but take back the middle-class family wagesand benefits as well as work-load protections districts had given to the teachers’ unions over the past five years or more. The argument was that the economic climate made it an opportune time to cut back teacher pay and benefits and squeeze more out of teachers with bigger class sizes and more hours in the classroom… because teachers would never dare to strike. It was at the 2009 winter conference of the Confederation of School Administrators (OACOA/OASE) that labor lawyer Nancy Hungerford presented her 12-page paper School District Options in Time of Financial Crisis. “Reopen the collective bargaining agreement (CBA) and reduce pay or benefits, with or without a reduction in work days,” headlined the opening section. Classified staff as well as teachers — even former administrators — who have weathered this year’s board actions in Gresham, Parkrose and Reynolds will find paragraphs that ring alarmingly familiar in this three-year-old document. ❏ down to how to get rid of an administrator. There is nothing here advocating anything illegal, or even sharp practice. Ms Hungerford and her brood are respected professionals. Rightly so. They could, and no doubt would, write you a detailed, strong brief on how to protect your rights at work against the school board… if you could afford them. But school boards, with tax-payer dollars and arcane budget heads where spending can be hard to trace, can. And they do pay Ms Hungerford lots and lots of our dollars. ❏ Representation in state and federal courts. Ditto for college employers who want advice on student disciplinary procedures. Then there’s advice regarding how to manage public meetings and public records issues, representation on ethics and open meetings law requirements, risk prevention recommendations, and so on. Look it up. The Hungerford family also train senior district staff and administrators. Ms Hungerford is the go-to lawyer if you are an employer. That’s simply what she does. We all have to make a buck. And that’s how Ms Hungerford and her kids make their buck, in the plural actually with lots and lots of s’s. School boards pay her their hidden tax dollars to work out how to screw — perfectly legally — their custodians, cooks, educational assistants, secretaries, teachers, counsellors, speech therapists, ELL specialists, bus drivers. Three years ago it was lots of legaleze and small print. Then son Brian put work in on Bargaining Trends and Bargaining Over Money in Difficult Times over 2010, fleshing out ideas about language, what words and phrases to go into a contract, what words and phrases must come out… from a district point of view. This year at the winter conference in the Salishan resort hotel at the end of January it was a powerpoint: New Challenges: Managing Labor, Employee, and Community Relations. “Communities do not back increased salaries and insurance costs – and employees know it,” Ms Hungerford told her audience of school administrators. New Challenges was about the tactics for introducing the legal assaults mapped out in the previous couple of years. Not only did they have the legal battlegrounds surveyed, they now had the plan of campaign, the logistics. What to do about a divided board, the chronic emailing parent, excessive public records requests, offensive threatening communications. The Does and the Don’ts: Do avoid or eliminate any language that limits teacher evaluations. Don’t allow “just cause” as an appeal route for a dismissed teacher. Avoid limitations on measures of teacher effectiveness. Can a position ever be filled with a new hire if employee on layoff not a “good fit” for opening? Must added hours be given to classified employees who have lost hours? When it comes to language, “less is best,” was the order of the day. That was the playbook. The only problem, the teachers were willing to strike. What the school board could have done… In a nutshell they chose to divide our community when they could have chosen to unite the community. PARKROSE school board has not shifted its contract offer once in more than ten months. The Parkrose teachers’ union, the PFA, has made five significant moves to try to get an agreement on the teachers’ contract. Now the board and superintendent have declared an impasse. Unless negotiations produce a settlement in the next few weeks, the board can unilaterally impose its final offer any time after Wednesday 11 April. Update: The board has issued a letter of intent saying it will impose its contract on Tuesday 17 April and PFA members have voted by more than 90% to give the authority for a strike Wednesday 25 April onwards. The board’s contract will mean up to $1,200 a month less in teachers pay for the next six months plus between $300 and $600 less each month after that. Of course, teachers are worried about such punitive pay cuts. They have families too. But the real fears are about how they can continue to do their jobs well and the future of education in Parkrose. Teachers’ working conditions are the learning conditions for students. For the teachers it’s about time. This year teachers agreed to a new schedule that increased their hours in the classroom by nearly 15% — nearly three weeks extra teaching time a year. The number of students teachers now see each day has more than doubled, up to 240 each day for some teachers. Class sizes have soared, some are now as high as 40+. And time for daily preparation was cut in half, to less than 50 minutes. On average teachers now have 56 seconds for each student each week in prep time. That to cover lesson prep, assessment, grading. Because these schedules and prep cuts were imposed in September, the superintendent and board disingenuously and loudly claim their imposed contract will not affect teacher’s time. It’s only about greedy and selfish teachers wanting to take more cash they say. Teachers’ workloads have gone up to make up for almost two dozen teacher jobs lost. Without the remaining teachers picking up that loss, many students could not now accrue the classes and credits needed for graduation. Teachers are more than doing their bit. This year’s incoming freshpeople are going to struggle to graduate, simply by virtue of the fact that there are too few teachers to teach too few courses for them to get the requisite 26 credits. The arts and foreign languages have been particularly hard hit. All this is causing serious stress inside the schools… for students as well as teachers. The teachers’ union, PFA, wants to discuss workload issues. The teachers are particularly resentful of the increased form-filling bureaucracy insisted on by the superintendent, which seems more about the superintendent imposing her inflexible managerial will rather than helping teachers use valuable time efficiently. Arrogant and pompous lectures by board members — particularly the board chair — about how to be a good teacher just exacerbate teacher frustration. Board members have barely spent hours let alone, days, weeks, months and years in the classroom. The board and superintendent refuse to even talk about such issues, issues which seriously impact students. Ask your own student. Teachers know school budgets are tight. That’s why last year the teachers agreed to ten unpaid furlough days — a 5% cut in pay — in a bid to keep teachers jobs. But the district still pink-slipped 13 teachers, including gutting another six from the high school. This year teachers have offered a package that cuts their pay by up to $200 a month, with five days furlough this year and another six next year as well as changes to benefits packages. But this is not good enough for the board and superintendent. They also want to be able to tear up the contract any time and demand more cuts from the teachers… most likely more cuts in the school year next year but not excluding more pay and benefits cuts. They claim there is no spare cash, period. But the audit and small print show there is enough to fund the difference between the board’s proposed punitive pay cut for teachers and what would still be a substantial pay cut for teachers, but a pay cut that teachers and their families can survive. More than $2.2 million in the budget is unassigned. A further staggering $0.5 million is assigned to teacher early retirement, to cover the unlikely event that all those who could qualify for early retirement will all apply in one go. And there appear to be bits and pieces salted away in other budget heads. And for the past years the board has always spent short of its budget as every final audit — including this year’s — shows. Teachers are not saying those sums should be assigned to their pay, far from it: but it is possible for the board to negotiate and move to make bearable the pay cut the teachers have said they will take. $400,000 is the difference between the survivable pay cut put forward by the teachers and the punitive pay cut demanded by the board and superintendent. After all, there is enough money to fund a $7,000 rise for the superintendent, taking her total package to some $170,000 a year, $30,000 more than that of Sam Adams, mayor of the city of Portland. And while teachers jobs have gone from the Parkrose classrooms — 23 in the past three years — jobs have been added in the superintendent’s district office. This rigid and vindictive attitude by the superintendent and her board seems to indicate there is more to this year’s negotiations than meets the eye. The reality is the school board and superintendent are exploiting the budget crisis to go much further than just balancing a budget. They are using the budget crisis, shock-and-awe, to destroy the teachers as a collective body, destroy their union. Inevitably this must undermine teaching and real education for school students in Parkrose. What the board wins now, it has no intention of giving back later. Its proposed cuts and imposed working conditions — for students as well as teachers — inside the schools will be permanent. When school funding eases the school board will not come back, saying words to the effect of, hey guys, thanks, let’s talk. As the board chair angrily told PFA negotiators — when no members of the public were present — the board simply thinks teachers are overpaid. And that’s what it’s about. Cutting teachers down to low-paid classroom operatives. The result will be a dumbing down of public education in Parkrose, lessons and student support reduced to the lowest rote common denominator. This is about cynically using a real budget crisis to tear apart teachers’ pay and working conditions, and emasculate the union as a credible negotiating partner. For ever… or, at least the next decade. There are clear signs that the board is working in collusion with the neighboring Gresham-Barlow and Reynolds school boards to undermine all teachers across the East County. The aim appears to be to gut the Oregon Education Association in the East County area. Gresham-Barlow school board has voted to impose its teacher-busting contract on 22 March and Reynolds is expected to declare impasse shortly. The three boards are coordinating their timetables to weaken the impact of any teacher strikes. Teachers need to give ten days notice of strike action. Whether or not it is the intention of individual board members, their version of the contract will further reduce the student experience in Parkrose to the lowest test-based production line. The actions of the board and superintendent will make teaching in Parkrose become a low-low middle class job, not even a profession. And the result will be to make education even more a mechanical chore for the students. Planned creative lessons will give way to whatever can be scrambled together, focusing on test needs. If senior experienced teachers retire early, so what? After all, there’s lots of young, eager new graduates willing to take low-paid jobs. Why pay experienced teachers? Why, even, encourage or help young teachers become experienced teachers? Gresham-Barlow is imposing a contract that allows it to get rid of experienced teachers in favor of lower-paid, inexperienced teachers. The boards just need cheap, licensed warm bodies to stand at the front of overcrowded classrooms teaching to the test. It’s the test numbers they follow. And when they go up — which they have — the Parkrose board passes a resolution congratulating… itself! The Parkrose board clearly signaled its attitude when it slashed the working hours and conditions of the Parkrose classified staff — custodians, educational assistants, admin staff — cutting benefits and pay to poverty levels. And leaving the most vulnerable students without the full support needed. The superintendent’s increasingly outdated autocratic, mechanical and bureaucratic management style — modeling her much-touted need for collaboration by refusing to collaborate with her own staff — points to a fundamental lack of inspirational vision, a future of Parkrose schools staffed by low-paid teachers working at a level barely above test-prep crammers. Large class sizes, rote lessons, little support, oppressive demoralizing management, teaching to the bureaucratic form and mechanical decree, all-important tests, bewildered and uninspired students. Factories, not schools. Please show support by liking Parkrose Faculty Association on facebook. REAL mathematics develops by stumbling forward, and occasionally backwards. Take a problem, try to solve it, reflect on what you’ve learned and then change the problem and try again. Heuristics. It’s not how the math textbooks present the subject. So, how to give kids a feel for thinking like a real mathematician? And gaining the confidence to think like a mathematician? As this simple problem (taken from Reardon Problem Solving available from www.as.ysu.edu/~thomasr/pss.htm) seemed to have worked, it’s worth sharing. As we started I emphasized the aim was for all students to feel how it feels to think like a mathematician: We were going to do a simple problem, focus on what it feels like and what we did… and then change the problem and try again. The problem: Take the sequence 1, 2, 3, 4, 5 and five circles arranged in a cross — with one circle in the center and two circles top and bottom and two circles either side. Place each number in a circle such that the sum of the numbers in the circles across equals the sum of the numbers in the circles going down. I asked my classes to try it out and emphasized I wanted them to remember their first thoughts on tackling the problem. Before I had finished introducing the problem hands were going up with students proudly declaring “done!” and sitting back with an answer on their paper. I asked a student to put up their answer. Immediately another student announced they had a different answer. And then a third, yet another answer. I asked if there were a fourth? With no takers, I asked students to recall their first thoughts. So, I pointed out, there’s at least three answers. And different students seem to have had different thoughts about how to start. Remember, in group work different students will have different approaches. We agreed the first attempts were starts to guess and check. Then we looked at the three answers on the board. Can you spot any patterns? I prompted. After an initial silence and a few stabs along the lines of the 1 and 5 always fall in the same line of circles, the focus was on the the number in the center circle. Students described the numbers variously as “odd”, “not-even”, or the “first, middle and last numbers”. Someone pointed out the totals were 8, 9 and 10. The sum of the top and bottom numbers must equal the sum of the two side numbers another pointed, leading a discussion that focusing on the outside numbers also gave clues. Ok, now try 2, 3, 4, 5 and 6. The response was quicker. And most students now carried on after finding one solution. Students put answers on the board. First thoughts included, “I went for the odd numbers in the center, but there were just two, so I put the even numbers in the center circle”. So, is there a fourth solution? I asked pointing back to our first list of 1, 2, 3, 4, and 5. Students seemed confident there wasn’t. Explanations focused on putting an even number in the center circle: there was then no way the four remaining numbers could be paired to give equal sums, or, the sum of the remaining numbers was odd and could not be divided by 2. So, will it work for any set of five consecutive numbers (we played hangman to get the word “consecutive”)? Yes, was the consensus. Students tried with their own numbers. Examples gave sums of tens, hundreds and even thousands, but with all students able to experiment with their own sequence. By now some students were branching out: It works for 30, 45, 60, 75, 90 said one (do they have common factors I suggested). Can we use decimals? asked another. What about negative numbers? another ventured. We summarized: If the first five numbers we looked at had been one of the latest student-generated examples, we’d have all got stuck and would have given up, I suggested. We went simple, guess and checked, learned from that, changed the problem and tried again using what we’d learned from our first try. And again. OK, does it work for any consecutive five numbers? Yes most agreed. But, bearing in mind this is an algebra class, how can we prove it? After a bit of prodding, x was suggested. Variables someone else explained. Looking back to 1, 2, 3, 4, 5 what if x =1, how would we write 2? I asked. y? said one student. z? another. Getting to (x + 1) didn’t come immediately. But (x + 2) came tumbling out once that obstacle was surmounted followed by (x + 3), each written below the appropriate digit 1 through 5. Now, the problem was to find three solutions for the consecutive sequence of x, (x + 1), (x + 2), (x + 3) and (x + 4). Use what you’ve learned I suggested. For some students this was a struggle, though most seemed to be able to follow along and find a second solution once a member of their group cracked it and gave one of the three solutions. Meanwhile, one student was changing the operation from addition to multiplication and another had expanded the sequence to nine numbers and circles. You can make it work he proudly announced. BREANNA is a quiet student who patiently sits in my math class waiting for the ordeal to end. She is too polite to complain or cause a fuss or disturb any of her peers with disruptive behavior. She does take some notes, and with encouragement will attempt some of my questions. But, to be frank, Breanna gets almost nothing from my math class, apart from sitting through a course she needs on her transcript to walk the walk. Breanna’s passion is drawing, mainly caricatures heavily influenced by animé. She is good, very good. Tucked under the notebook for my class is her pad. As token gestures go into her math notebook, a detailed and dramatic picture builds unseen on her pad. project, Breanna got the basics, but was happier coloring the triangle. 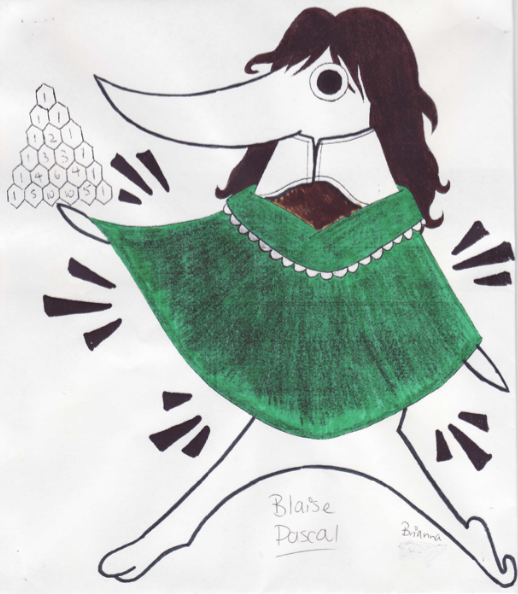 Draw me a picture of Blaise Pascal I suggested (result, left). Last year I had tried an art and geometry project with my geometry class. The task was to find an artist who uses math or geometry in their work and become an expert. For various reasons it was less than a success. But would it work for Breanna? Her eyes lit up, yes she said, it sounded interesting. She would research artworks, choose an artist or an art movement or the art of a culture (I secretly hoped she’d opt for Islamic art), become an expert on both the art and the mathematics and give a presentation to the class. Dutifully she showed me her growing list of artists and I eagerly awaited which one she would choose… Vasarely, Riley, Mondrian… hopefully not Escher. Is it OK to look at pyramids? she asked. The proportions are interesting she explained. Since her math notebook — not her art pad — has added calculations about the angles and proportions of the Gizza Great Pyramid and neighbors. Was it OK to look at less famous pyramids asked Breanna. Her self-selected extension was to find some more obscure pyramids and compare the proportions. Then came the poster, with a giant yellow pyramid, drawn to the correct proportions. ❏ For me, the value of this project was that Breanna did some mathematical thinking, where before she was doing none, other than sitting through a curriculum that had little interest, meaning or use for her. It was also interesting to see that simply giving Breanna the freedom to pursue some mathematics of her own choice based on her own interests did indeed lead to some mathematical work. What was surprising was that Breanna didn’t choose an overtly artistic piece of mathematics, such as a painting influenced by geometrical shapes. Though, in Breanna’s eyes a Pyramid is a piece of art. TILTED SQUARES from the inspirational UK site nrich.maths.org is a great example of an open-ended math problem that leads to some deep math thinking… even among students who don’t normally show much interest in their math lesson. The task at first sight appears to be quite simple. 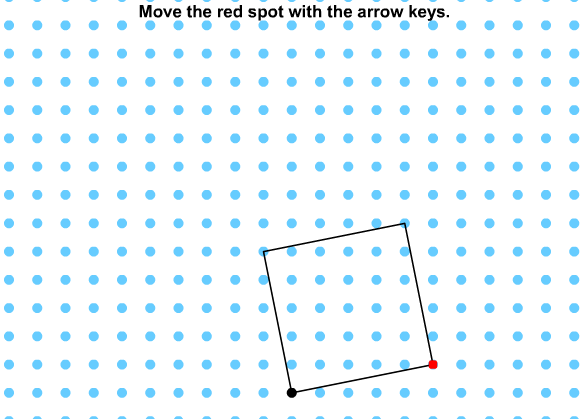 A square drawn on square-dotted paper is tilted by raising the lower right-hand corner vertically by one dot, and a new square is then drawn on this tilted base. The question is, what is the area of the new square? And then, is there a pattern to the areas with continuing tilts, as the lower right-hand corner is raised by a dot at a time? The immediate response of almost all the students in my classes was, the first square and the second square were exactly the same. This, even from my most accomplished mathematical thinkers. The Nrich site has an interactive program, so the square can be repeatedly tilted and projected. Even on tilt three or four students were still insistent the areas remained the same. Only when the square had tilted to become what students call a diamond, was there questioning. My two most inquisitive students held out until after they’d carefully drawn and cut out the first two squares and placed one on top of the other before they would countenance any change. Problems from Nrich seem to self-differentiate: two students who rarely are able to engage in more traditional exercises, quickly constructed on dotted paper a pattern of 18 tilted squares. They were excited. They were animated. And they wanted to talk about, and show what they had done. Others insisted on constructing the pattern on the interactive whiteboard. They did this while some of my more “analytical” students struggled to visualize and draw the squares, unable to identify the corners of a newly-tilting square. Some students explored finding the areas of the square by measuring, and others tried Pythagoras. The first found the results frustrating as they estimated fractions of a millimeter change in length, squaring the answers and ending up with lots of decimals and no clear pattern. The Pythagoreans built up tables and areas and tried to spot a pattern in the growth. They quickly spotted a pattern which they could verbally explain and extend, but could not or would not commit their analysis to paper, other than to list the answers. Students were encouraged to try with a differently-sized first square. With a smaller starting square, the growth in area is more quickly apparent. The Pythagoreans could verbally list the areas with ease. But they refused to countenance any search for a method that could be committed to paper. 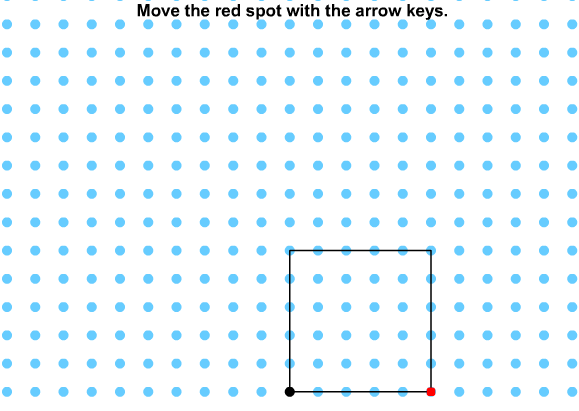 The majority drew several squares, and tried to estimate the area by counting squares formed by the dots — or just counting dots as an estimate. They could not extend to the results of the Pythagoreans, but were much more open to watching some hints on the interactive whiteboard: Why not a square with a horizontal base around the outside of any tilted square? The area of the outside square, subtract four triangles and you have the area of the tilted square. The visual approach appealed to our early pattern artists, and provided the clue for the majority who were searching for a calculation. Quickly more areas were forthcoming, while the Pythagoreans reluctantly drew some titled squares with exterior square… only to dismiss the approach with open scorn. What if there are 99-tilts? The Pythagoreans raced for the answer, but could not agree. Meanwhile another hint: Build up a table breaking each area calculation down into all of its detailed parts, including some reference to the tilt number. Use different colors for the numbers from different parts of the calculation, red for the tilt number, green for the side length of the outside square and so on. Is there a pattern? What if the tilt number is n, representing the nth tilt? Can n be identified in the pattern? The early doubters confidently give the answer for the area of the 99th tilt. The Pythagoreans are still arguing about the mental math, though there are signs on paper of the formula that was, indeed, in their heads. And the artists had now produced colored titled squares and were demanding their works were now put on display. Now that’s enriched mathematics. And nothing feels so Good!